Chapter 4 Page 23 is up. Blaise gets to work on the Siegneur’s chest. It is fortunate for him that Snow-by-Night is with him. 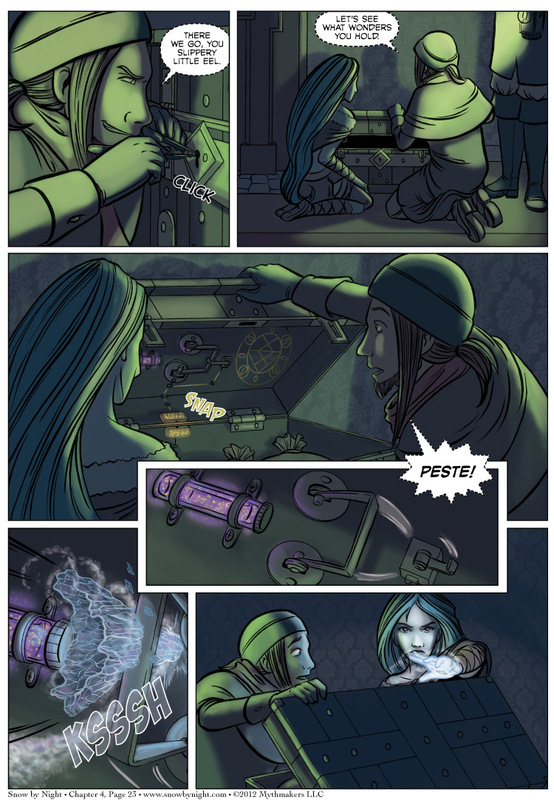 To see a glimpse of Wednesday’s page, vote for Snow by Night on Top Web Comics. Our next convention is Connecticon on July 13-15. It’s going to be a great time. Come see us. On a side note, there’s a Kickstarter project I wanted to tell you about. Lee Garvin has created a fantastic card game titled Badass Zombie Killers. This competitive card game makes getting ready for the zombie apocalypse an exercise in fun. Do you have your zombie apocalypse plan ready? I’m checking this on my phone, so the art isn’t clear: what triggered the trap? Blaise opened the chest. There was a wire on inside that snapped when the lid was lifted. This released the tension that held the tension spring in place. That is a quality pun. You have Blaise’s Stamp of Pun Approval. Question: has the symbol inside the chest any special function (Full Metal Alchemist style) or is merely decorative? While all the alchemy glyphs in the comic have been thoroughly researched, this one was made up a bit on the fly (with what I could remember from all my previous research). Thanks for answering, but what I´m really asking is if the symbol has any effective “magical” property, or is merely the equivalent of a charm of good luck (in our world. It has an effective magical property. Jassart will explain what that is in tonight’s page.